Fiber type must match the type of fiber in the cable plant. For multimode cable, use only 50/125 patchcords with 50/125 fibers in cables and 62.5/125 patchcords with 62.5/125 fibers in cables. Although there are several types of each size fibers, matching the fiber type exactly is generally not required, e.g you can use OM3 patchcords on OM2 or OM4 cable plants. Singlemode fiber is mostly the same, but some long distance fibers have different mode field diameters and should use patchcords with matching fibers. Some patchcords are made from special bend-insensitive fibers. Although there has been some controversy about the compatibility of BI fibers to normal fibers, manufacturers seemed to have adapted their designs to ensure compatibility. Choose patchcords with proper cable jacket color codes. This can help prevent mismatching fibers, especially multimode fibers. Choose patchcords with the correct matching connectors. Choose connector types that match the connectors on patch panels and equipment. Since many cable plants use one type of connector and the equipment another, e.g. STs on a multimode cable plant and LCs on the equipment, you may need to stock hybrid patch cables with different connectors on each end to make the connection. For singlemode networks, the connectors must also have the proper finished ferrule ends, either PC or ultra PC polish for most systems or angled PC (APC) connections for higher speed systems or those carrying AM video. Do not mix PC and APC connectors as that may damage them! The TIA 568 color code for connector bodies and/or boots is Beige for multimode fiber except aqua for laser-optimized fiber, Blue for singlemode fiber, and Green for APC (angled PC) connectors. The performance of a fiber optic network (and copper networks too) can be undermined the performance of the patchcords used for interconnects and connecting communications equipment. But it's easy to take patchcords for granted. They are inexpensive, often not tested properly if at all, and sometimes treated badly. Most users buy patchcords in bulk and store them in boxes until they are needed, when they are unpackaged and plugged in. Some users hang them on the sides of the equipment racks. That's not how they should be handled. When it comes to patchcords, there are three issues: quality, cleanliness and condition. You might assume that the patchcords you buy are good quality. They come in plastic bags usually with a label that identifies the fiber and connector type, length and test results. We’ve seen cheap imported patchcords with connectors with locking mechanisms that would not connect because they were improperly made and connectors with losses that tested at 1 dB although the label said 0.2 dB. Under closer examination, the label appeared to be from a copy machine not a printer, so I doubt the cable was even tested. While it's inconvenient and expensive, testing every patchcord is highly recommended per the standard test, FOTP-171. 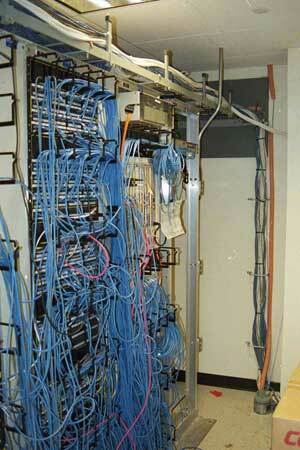 If you do not test them and have network problems, then look at them first when troubleshooting the system. 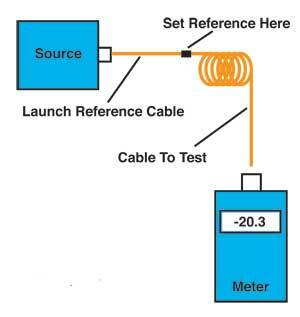 Testing patchcords is similar to testing any fiber optic cable. Use one reference patchcord to set a 0 dB reference. Connect a patchcord to test to the reference patchcord with a mating adapter. Connect the power meter to the other end of the patchcord and measure the loss. 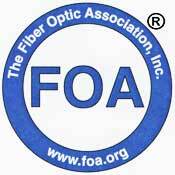 Since the length of the fiber is short, the loss contribution of the fiber is ignorable. And since one end of the cable is attached to the power meter, not another cable, you only measure the loss of the one connection between the reference cable and the cable under test, so you can test each connector individually. To complete the testing of the patchcord, reverse the cable you are testing to check the connector on the other end. Sometimes you will find one bad connector and can replace it to make the patchcord useful again. But often the cost of replacing the connector may be higher than replacing the patchcord itself. Cleanliness is an issue with brand new cables as well as used ones. All connectors should always have the polished ferrule covered by a “dust cap” to protect the end of the connector ferrule from damage and dirt. However, a user recently told me that after examining many connectors with a microscope, he understood why they were called dust caps, they were all full of dust. The dust cap should be used to protect the connector ferrule, but do not assume it keeps it clean. You must clean connectors before inserting them in mating adapters or active devices to ensure they are really clean. Here are directions for cleaning. Those cables connecting equipment to the cable plant or hanging on the sides of racks are often mistreated, leaving kinks in the cable or scratches and scuffing on the connector ferrules. With the reference cables used for testing, the continual mating to other connectors, even when carefully cleaned before use, will cause scuffing that increases loss over time. 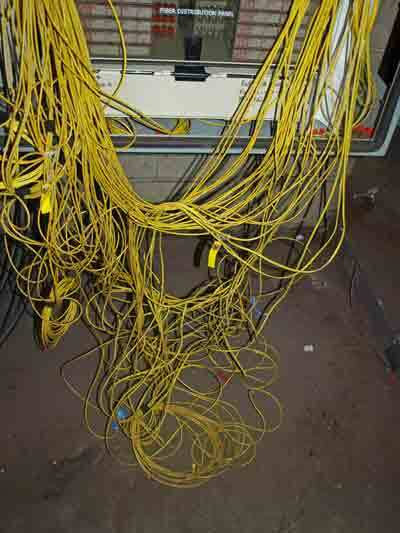 What this means is patchcords need continuous inspection and testing. It only takes a minute but can save you lots of troubleshooting time. Start by checking the connector ferrules with a fiber optic inspection microscope, preferably around 100 power, then test according to the procedure above.